United Services technicians are trained and certified to clean a structure from top to bottom, along with all of its contents. 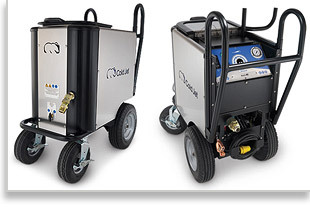 Our primary goal is to minimize overall project costs by restoring vs. replacing, while leaving the building odor-free, and most often, cleaner than it was pre-loss. For some cleanup projects United Services employs dry ice blasting (shown right). 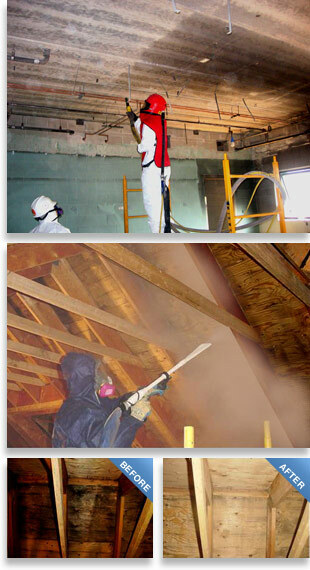 This process is especially useful for mold remediation. You can learn more here. See a video demonstration of this process. Contact our company today for fire damage restoration and structural cleaning in Highland Park, Lake Forest, Wilmette, Mount Prospect, Winnetka, Golf, Buffalo Grove, Crystal Lake, Wheeling, Glenview, Lake Bluff, Kenilworth, Evanston, Palatine, Skokie, Janesville, Des Plaines and the surrounding Illinois & Wisconsin area. In some cases, reconstruction or repairs will be necessary before the property can be inhabitable again. In such circumstances, we offer a trained and supervised moving crew to pack out the contents of the home and bring them back to our facility. Our pack out process includes a complete electronic inventory of all items removed from the premises for those clients who wish to include this state-of-the art service. At our processing facility, the contents are carefully cleaned and deodorized using a variety of methods including ultrasonic cleaning, and the latest in soft contents cleaning in our Esporta machine. After processing, items are repacked and placed in protective storage vaults to await their return. The individual storage vaults are kept in our temperature-controlled facility. When the property is again inhabitable, United Services will carefully return the cleaned items back to their original location.